Time is running out on work crews on Highway 17 in the Santa Cruz Mountains as they try to clean up a mudlside and stabilize a hillside before more rain halts their efforts. For commuters through the Santa Cruz Mountains, just being aware of the massive slide near Scotts Valley doesn't mean they have options. 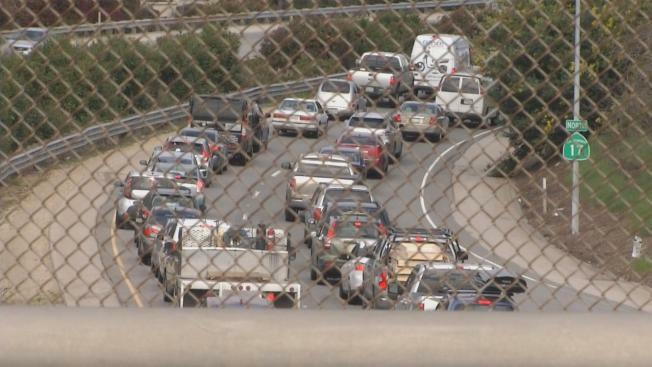 Northbound traffic on Highway 17 was at a virtual crawl all day Wednesday. Scotts Valley police, the California Highway Patrol and Caltrans closed off some ramps between 7 a.m. and 10 a.m. to reduce traffic from drivers looking for ways around the jam. They plan to do the same Thursday and Friday. "As a resident, I completely understand," said Tina Ash, of Scotts Valley. "Because it's going to back up traffic on Scotts Valley Drive." Caltrans crews continued ising the special "spider" unit to help stabilize the hill where tons of mud came down Feb. 7. For days, traffic has been reduced to one lane in each direction using the two southbound lanes. Meanwhile, as other road closures keep Caltrans crews working around the clock to beat the next storm, a civilian work crew that jokingly calls itself the "vigilante pothole team" has sprung into action on the smaller jobs. The team is comprised of rotating volunteers working with materials supplied by the county to help city, county and state entities stretched too thin. "We're looking for the big ones, where when you drop into it, your tires just explode, right?" Larry McVoy, the team's organizer, said about fixing potholes. "Those are the ones we're trying to patch." As for the Highway 17 mudslide fix, officials still weren't sure when the all lanes of the roadway would reopen, and the incoming storm likely will cause another delay.